It was Day Two on our Intrepid tour in the Outback, and it felt like we’d been together for a week. I had introduced myself to most of my fellow travelers, and some had introduced themselves amongst themselves, but here had been no “formal” introductions that included all. I was the oldest member of the group by a good 10 years, so I like to think I was just more mature and had better social skills than the rest of them. Everyone thought it was a good idea. We went around the circle, each person saying his or her name and where he or she was from. When we got to the Chinese pair, the young woman stood up and gave a speech with her Chinese name, her English name because no one could pronounce her Chinese name, where she was from, where she lived in Australia, the name of the bank she worked for, her job title, and her leisure interests, which of course included travel. We then turned to the older man beside her; he was sitting a ways outside of the circle and staring into the bonfire as he slowly took drags off his cigarette. I waved a hand at him, “Hello! Would you like to introduce yourself?” He stared straight ahead, giving no sign that he was aware of us. That didn’t explain why he wouldn’t join in. He could have asked her to translate. Was he autistic? Antisocial? Shy? Depressed? Heidi chatted with the Canadian couple. The woman was a marine biologist and he was a book editor for a publishing house. They lived in separate cities and were engaged and would have to figure out where to live where they could both work. We had all been examining the sky. Rare is the night I can see stars in the city. I had gasped with awe to see the Milky Way in August in northern Wisconsin. It had been splashed across the sky in a horizontal arc. Here, it seemed to rain down vertically. Was that because of where we were, or the time of night, or the season? The English-Australian guy was pointing out the Southern Cross, which was also tattooed on his calf, and one of the German girls excitedly pointed out the Big Dipper. The Canadian guy had been fiddling with his cell phone and then sprang up, “I’ve got this app to show us the constellations!” He held it aloft and it showed lines connecting the stars composing the Orion Belt. The Swiss guy, not to be outdone, held up his ipad, which had a similar app but with more bells and whistles. The apps were cool, but the magic was gone. There was no searching, no excitement upon finding, no mystery, no helping fellow travelers by pointing and painting a verbal picture. It was Stars for Dummies. I left the group to join James, the Korean cook, who was sitting by himself. No one engaged with him, perhaps because his English was so rough. Or maybe it was because he was the only solo traveler. I’ve been that solo traveler on many a journey, and people do tend to ignore you. We’re so uncomfortable with people on their own. James confided that he was depressed and very anxious about going back to Korea. He didn’t want to go, but it hadn’t worked out here. He was a failure. I tried to reassure him, “But you tried! You took a risk, which is more than most people ever do.” I don’t think he bought it. In our tent, Heidi and I could hear the Chinese dad yapping incessantly to his daughter in the next tent. This entry was posted in Adventure, Budget travel, Culture shock, Travel and tagged Australia, Outback, Stargazing, Technology on December 3, 2018 by Breaking Free. Tesfaye told me he was really worried about losing his job. It turned out he didn’t actually have a teaching degree, he had taken a course and a test right out of high school to become a guide. His hope? It must have seemed hopeless to him to earn a degree. Why wouldn’t the government pay for someone like him, who was obviously smart and experienced, to get a degree? Or why not grandfather him in? Was it some scheme to make sure all the jobs went to cronies of government officials? As often happens when you travel, there are questions to which you’ll never have answers. He showed me some of the earliest paintings, and others that were created by the Portuguese. The difference was stark, both in the brightness of the colors and the features of the Madonnas. I wasn’t sure why the Portuguese Madonna’s face was so white. 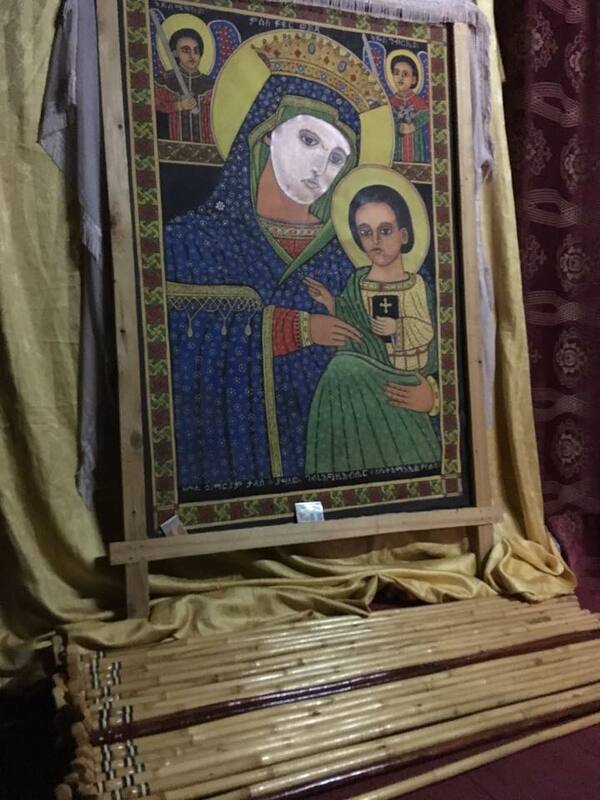 I mean, I’m sure they wanted to impress on the Ethiopians that the Virgin Mary was white, for God’s sake!—but this white? Oh ick. “What religions are they?” I asked. Again, uh …awkward. Coming on the heels of the comments about lechers and prostitutes, was he coming on to me? He was probably younger than my son. I’m sure he was lonely, with his wife gone, but. Maybe it didn’t mean anything. Tesfaye shrugged and walked on. 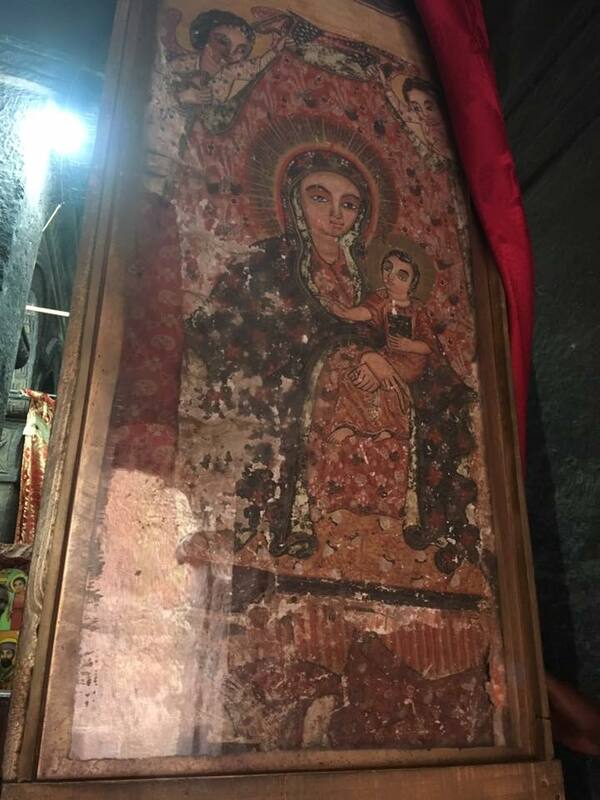 “Ethiopian Christians are supposed to make a pilgrimage to Lalibela or Jerusalem in their lifetimes.” Tesfaye said. “They are especially supposed to visit Lalibela at Christmas.” I had seen some pilgrims wrapped in white gauzy robes. The thought of thousands of people in white floating around Lalibela during the Christmas season sounded lovely. Tesfaye talked about the Italians. The Ethiopians had fended them off in 1895. Humiliated that an African country had beaten them, the Italians came back and won in 1935. “But we were only a colony for five years,” he said proudly. We walked back to Tukul Village and I paid Tesfaye the agreed upon 600 Birr, which amounted to about $25 for the four hours we had spent together. I wondered if I should invite him for a beer in the restaurant, or tip him, but I was tired and just bade him farewell. The huts had Internet, so I gleefully spent several hours online. There’s a myth that “There’s Internet everywhere,” and that “everybody has a smart phone” and is on social media. At the office, I couldn’t even get an Internet connection using a cable. Maki gave me some kind of Chinese dongle that was supposed to work but didn’t. I couldn’t get a 3G signal in the hotel. When I did get online, the connection was excruciatingly slow. I was grateful to have a signal. I was grateful to learn that I could lose five pounds with one simple trick, to see that my son’s friend had installed a new faucet in her kitchen, and to watch a video about Albinism Awareness Week in Australia. This entry was posted in Adventure, Budget travel, Culture shock, International Development, Living abroad, Travel and tagged Ethiopia, Technology, travel on July 26, 2017 by Breaking Free. These are questions I always get when I get home from a big one. The first one is so broad that all I just say, “It was great.” If the asker is genuinely interested in knowing more, he or she will ask more questions. The other two are meant, I think, to keep the returned traveler hemmed in so he/she doesn’t go on and on. I don’t blame the asker; not everyone has time or interest in hearing details about someone else’s trip, but when you see someone at work who’s been gone for a month you have to ask them something, if for no other reason than to be courteous. Personally, I love hearing about other people’s trips, as long as they’re not cornering me on the way to a meeting or shoving their cell phone in my face to show me videos of their roller coaster ride at Disney World. I hadn’t set out to be mindful, and now I wonder if this is one of the things I’ve loved about travel all along but was never aware of. I was traveling alone for the first 10 days so I had to really pay attention to, for example, what time the train left. I had to be aware of my surroundings for safety’s sake. I needed to remember to ask the hotel front desk to print my boarding pass when I had a flight the next day. So there were things I had to attend to, but this reinforced being in the moment, I was nothing like the Human Doing I am at home. Being in the moment doesn’t mean you’re never irritated. Am I the only one who doesn’t love the screens embedded in airplane seat backs? They’re great for watching movies. But they are set to be on, all the time, unless you turn them off. I woke up at some point during the flight and staggered down the aisle to the toilet. Delta requires people to lower their window shades and turns off the cabin lights. But 90% of the screens were on—hundreds of “Delta” logos glowing white and red. People were sound asleep with these screens a foot from their faces. Back in my seat, I looked at the guy across the aisle and one row in front of me. His screen was on, his wife was asleep but her screen was on, and he was playing solitaire on his phone. And we wonder why it’s so hard to sleep on planes. This entry was posted in Adventure, Budget travel, Joie de vivre, Travel and tagged Mindfulness, Technology, travel on December 2, 2016 by Breaking Free. This post has nothing to do with mass incarceration or terrorism or any of the other lighthearted subjects I write about, but I wonder if it wears away at me nonetheless, day after day. Have you noticed the proliferation in unnecessary noise and lights? For instance, I spent a night in a hotel this weekend and I counted the unnecessary lights as I tried to get to sleep. There was a white light on the smoke detector, a red one on the TV, another one on the DVD player, one on the phone, a green one on the key card holder by the door, another on the bedside clock. Why? I had closed the drapes to block out the millions of lights from the skyscrapers surrounding the 23rd floor room, but that didn’t do anything to block the lights inside. Were the technicians who designed all these gadgets worried I might get up in the middle of the night and crash into the TV screen because I can’t see it in the dark? The previous week, my friend Sarah and I were hanging out at the Mississippi River. We meet up there every couple of weeks on nice days, bring chairs, and watch eagles soar and the sun sparkling on the water as it rolls by and we update each other on our lives. There is an off-leash dog park across the river from the park we hang out in. It’s a source of occasional irritating noise pollution in the form of barking, but on this day it was incessant. There must have been 10 dogs barking for a half hour or more. Then, a guy backed his boat trailer into the river and proceeded to rev his engine, which in addition to generating annoying noise, produced billows of diesel fumes. Sarah and I and the others around us exchanged looks. How long would this go on? Sarah and I and our neighboring nature lovers picked up our chairs and moved upwind of him, which didn’t do anything to decrease the noise. We expected him to purposely keep on for longer than five minutes but true to his word he finished and left. “I was thinking the other day,” said Sarah, who is as curmudgeonly as I am, “of all the ways this park could be ruined. “First, they’ll install wireless, and put up signs everywhere announcing it as a great new feature.” As she said this, a couple strolled by on the beach with their two young children, both the parents staring down at their phones while the kiddies toddled near the river’s edge. She was interrupted by a loud buzzing noise. I’m not kidding. It was a drone. Everyone stared over at it, and Sarah whipped out her camera to take a picture. “Don’t encourage him!” I pleaded. But she wanted a photo to show her son. The drone droned on for 10 minutes or so, then the owner must have gotten bored and left. So much for watching eagles soar. There are lots more unnecessary lights and noises at work, at home, in bars and restaurants, on trains, and especially in airports. Argh! Don’t get me started on airports and airplanes. Does all this screen presence and beeping/barking/buzzing/bloop bloop blooping bother me so much because I am old? Do younger people, the so-called digital natives, just not notice it? Maybe they actually like it? Maybe they actually need it? This entry was posted in daily life, Empathy and tagged boundaries, Noise, social media, Technology, travel on November 24, 2015 by Breaking Free.